I’ll apologize now, for this is an account with more questions than answers; a story of heartbreak and hope without an ending. 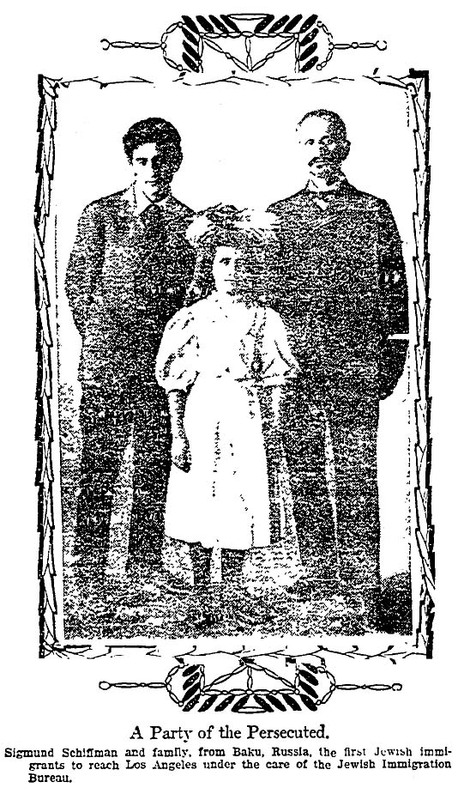 The Times features three members of the Schiffman family who are Jewish refugees from Baku, Russia (now part of Azerbaijan): Sigmund, the father; Benjamin, the 15-year-old son, and Emella [or Emelia], the 10-year-old daughter. 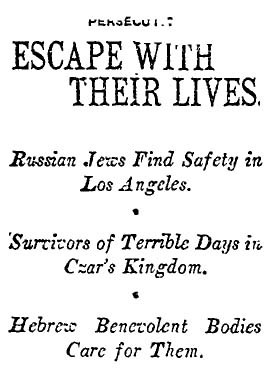 The Schiffmans have been brought to Los Angeles as part of the Galveston Plan, in which Jews were taken to Galveston, Texas, for dispersal throughout the West because New York was overcrowded. Although Sigmund is quite a scholar, speaking German, Russian, Polish, Greek, Latin and, of course, Hebrew, he is making a living as a door-to-door salesman. Benjamin, according to The Times, has had to abandon his education to work in tailor shop. “He is a faithful worker but his youthful spirit rebels at the change from study to ‘rubbing clothes,’ ” The Times says. What became of the Schiffmans? We simply have no record of them. Not in The Times, not in online public records—nowhere. Perhaps they changed their names or perhaps they left Los Angeles. All we do know is that the local Jewish organizations, B’nai B’rith, the Hebrew Benevolent Society, the Jewish Women’s Foreign Relief Association and the Jewish Sisterhood helped them. Sigmund Schiffman was supposed to address a group about “Governmental Conditions and Methods of Persecution in Russia,” but The Times apparently did not cover his talk.